Michael grew up swimming the Smith River. A huge perk of our extended stay in the area is for the kids to have the time with Grandma AND to enjoy the river and hikes Michael loved so much at their ages. Most days Michael is in pain....and some days the tremors are bad and his balance is wonky.....this has made working out increasingly difficult. Swimming is an exercise he can do... He has prodded the kids into swimming too. He likes swimming rapids and long swims. Nolan and Alex have joined him for the long swims. They did a couple of practice runs and then hit upon a goal: to swim from the forks to the mouth of the Smith River. This will take several long swims to accomplish. Stacia is doing great on the practice runs and can swim a few rapids, but isn't confident enough to go on a two or three hour swim. On their first swim, they swam from the forks of the Smith River (a spot we drive by daily to get to Mom G's) to the Footbridge at Jedediah Smith State Park. Nolan was sick and missed today's swim. 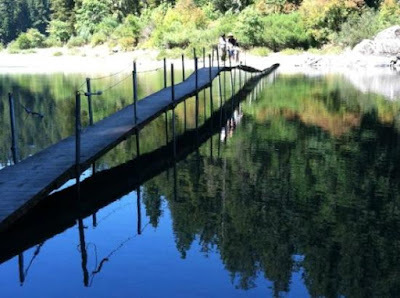 Mr. Dave joined Michael and Alex to swim from the Footbridge at Jed Smith to Templeman Grove (up hwy 197). This 3 mile swim took 3 hours. Here's the spot where Stacia and I met the swimmers on the Smith River at Templeman Grove. Don't bother telling me Michael shouldn't be doing this. He needs exercise. His neurologist told us to go make memories and that is what he is doing. If not now, when? He knows his limits and will not push beyond what he or the boys can accomplish in a day. Michael is disappointed to report he found a school of suckers in the swim today. He and some friends thought they'd cleared out the river decades ago. There are still none in THEIR part of the Smith River, but they are making a comeback. None of us are guaranteed tomorrow. Best to make the most of each day. Glad to see you doing that. What a great accomplishment that will be.